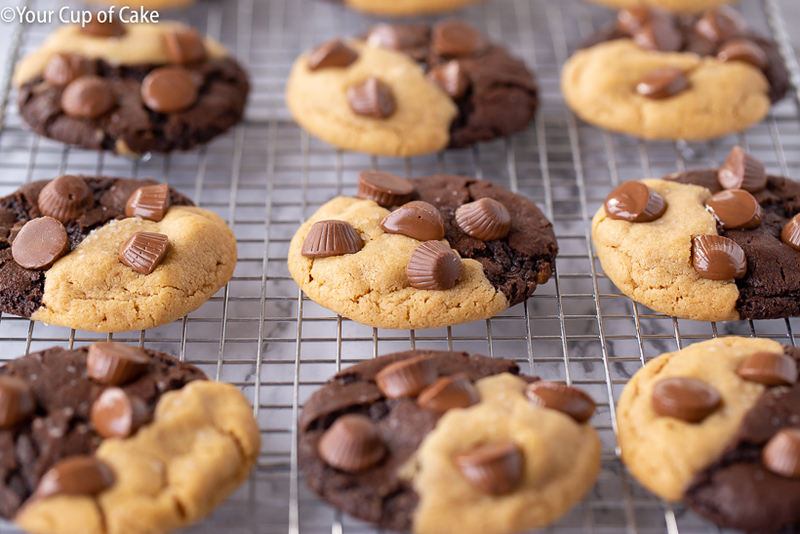 Ultimate Chocolate Peanut Butter Cookies with Reese’s Peanut Butter Cups! 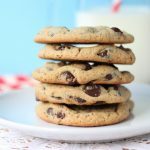 These cookies are easy to make and have it all! 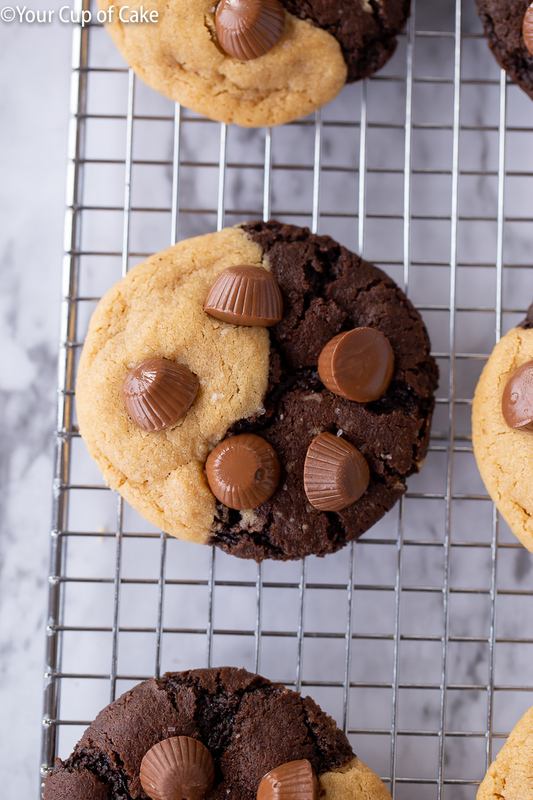 Your new favorite cookie has arrived! 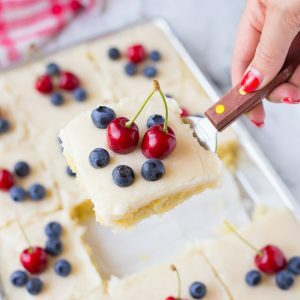 This recipe is based off of the amazing Sally’s Baking Addiction! 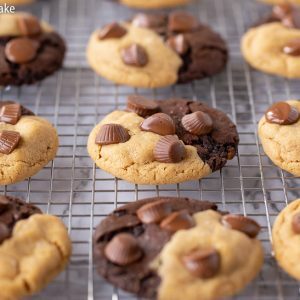 Her Peanut Butter Swirl Cookies have always been something I’ve wanted to try but I knew I wanted to all some Reese’s Cups in them to really make them over the top! Yes, you do have to make two separate doughs but wow, are these worth it! 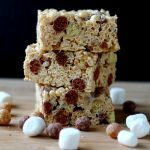 They’re such a showstopper cookie and if you show up to any party with these you’re guaranteed to get swarmed with people asking for the recipe. 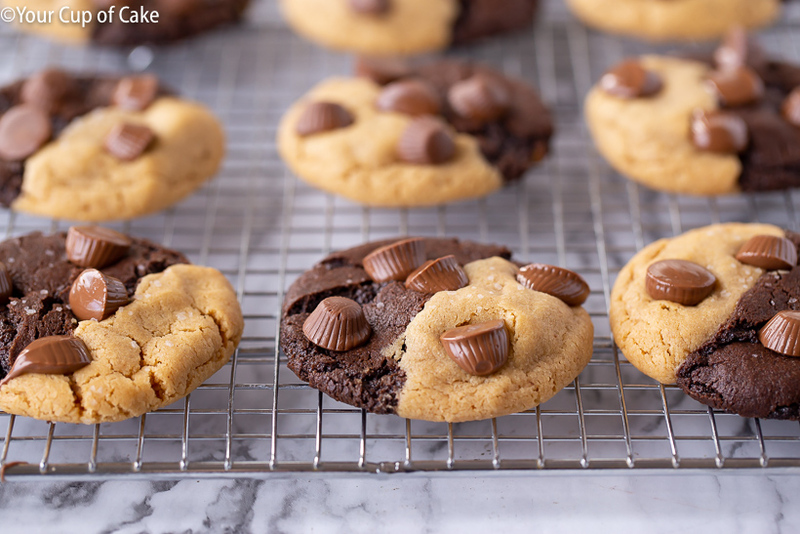 My number one tip would be to not over-bake these! 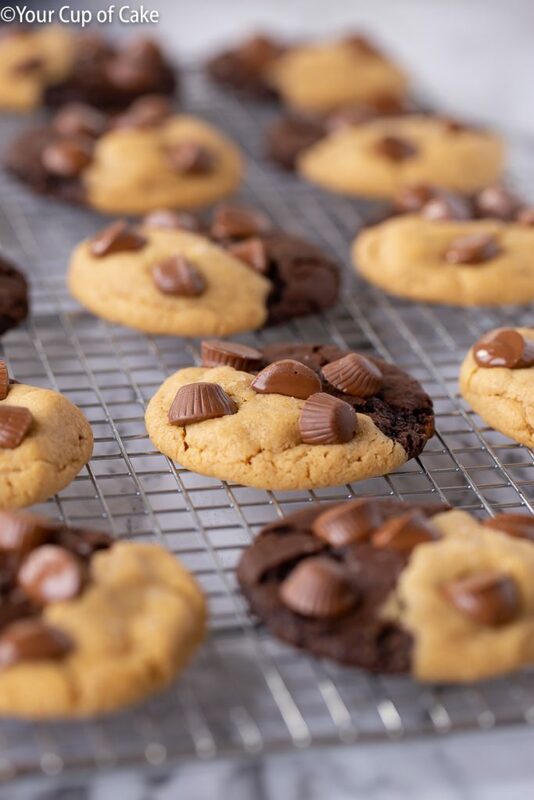 With any peanut butter cookie, you really just don’t want to dry them out! I always like to sprinkle a little coarse salt on my cookies before I pop them into the oven. It really brings out the flavors! 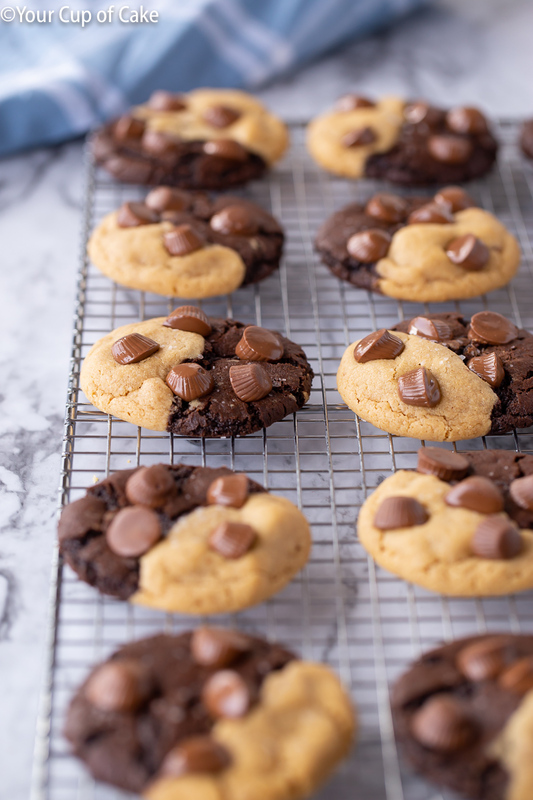 These Ultimate Chocolate Peanut Butter Cookies are for all the people who just can’t get enough peanut butter in their life. 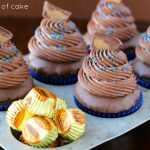 If your husband is one of those people, you need to make these for him for Valentine’s Day, his birthday or just to surprise him! 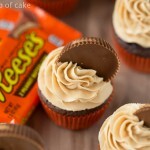 My best friend is obsessed with Reese’s so I know what I’ll be making her next time we meet up for lunch. 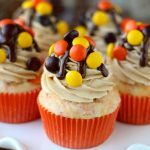 Okay, so I keep saying there are Reese’s Cups in these but I actually used the mini peanut butter cups from Trader Joe’s! 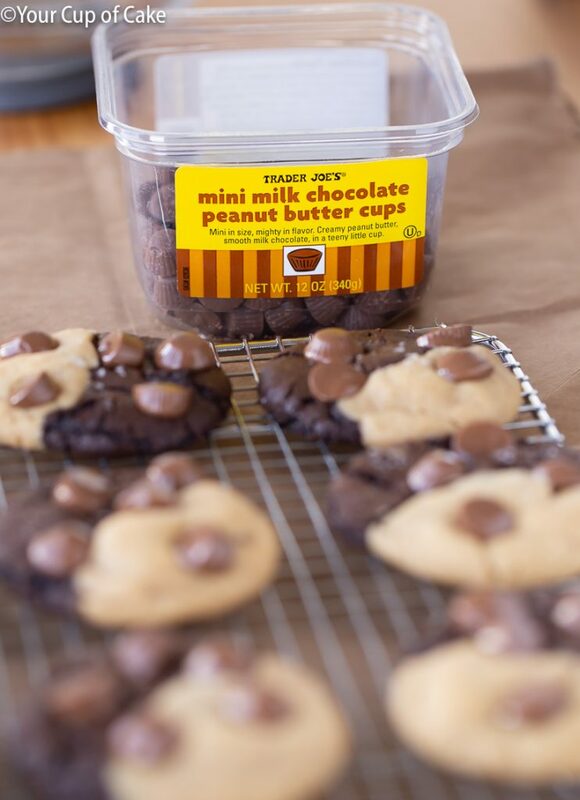 I have made cookies with the mini Reese’s Cups and they are great too, but I had the Trader Joe’s version on hand and I actually love the chocolate in them more. But be careful, if you buy these you’ll end up just eating them straight!! These Ultimate Chocolate Peanut Butter Cookies are just so pretty and magical! 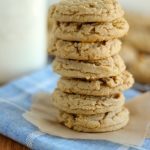 Peanut Butter Cookie Dough: Cream butter and sugar together until light and fluffy, about 3 minutes. Add in peanut butter and beat again. Scrape down the sides of the bowl and add egg and vanilla, mix. In a separate bowl combine flour, baking soda and salt. Add dry ingredients to wet and mix until combined. Dump out into a separate bowl. No need to wash the mixing bowl! Just start making your chocolate dough! 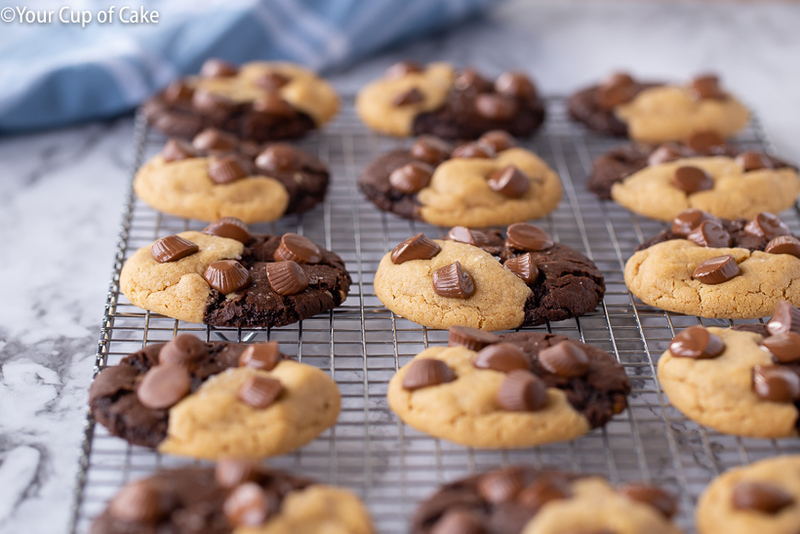 Chocolate Cookie Dough: Cream butter, sugar and brown sugar until light and fluffy, about 3 minutes. Scrape down the bowl and add egg and vanilla extract, mix again. In a separate bowl combine flour, cocoa powder, baking soda and salt. Add dry ingredients to wet and mix until combined. Make tablespoon sized dough balls of each dough and let chill in the fridge for at least 2 hours. 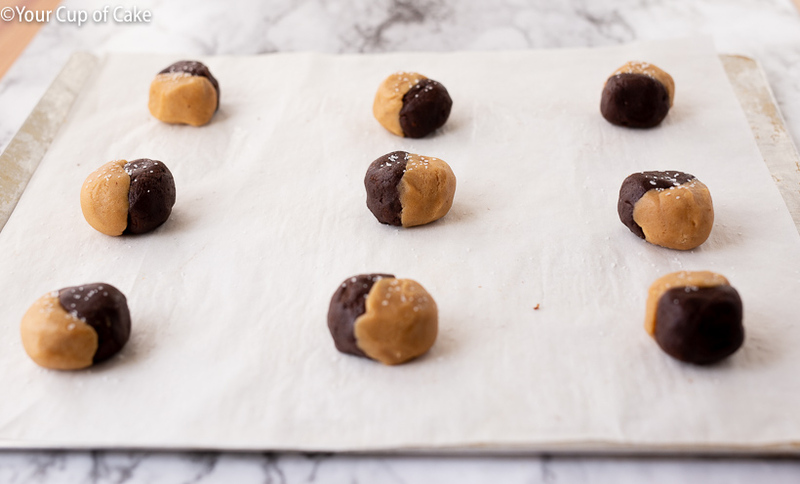 After they have chilled press a peanut butter dough ball together with a chocolate dough ball and roll in hands until it's one happy chocolate pb dough ball! Place on cookie sheets sprinkle with coarse salt for added flavor and bake at 350 degrees for 10-12 minutes. 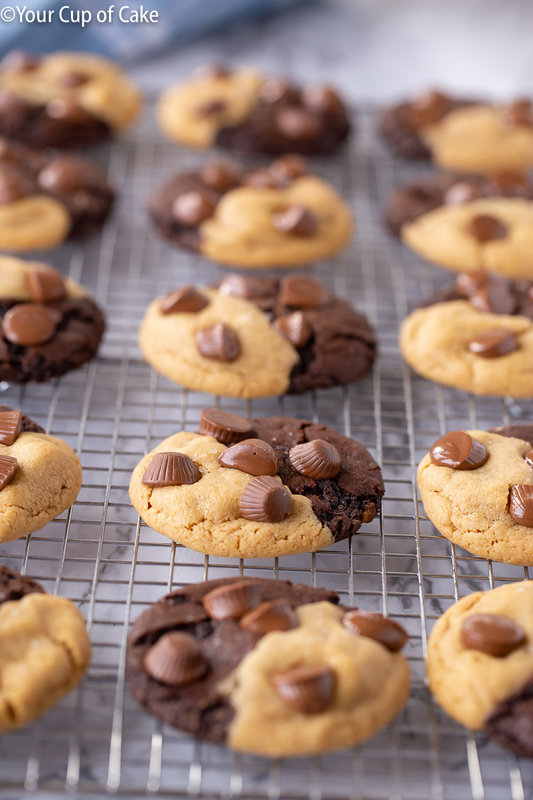 Let cookies cool for 2-3 minutes and then press in a few mini peanut butter cups to the cookies! Enjoy!